Super 1 deli manager Susan Greenhalgh wants everyone to feel welcome in her store. About two years ago, I went into Super 1 Foods on a mission: I had a new recipe and I needed some cheese. In the deli department, I was overwhelmed by the array of choices. There was a woman stocking the cheese table that evening, and we struck up a conversation. Although she didn't have the cheese I was hoping for, when I described it (an aged cheddar, almost like a Parmesan) she placed a brick into my hand. "This will be just as good," she said. It was delicious. 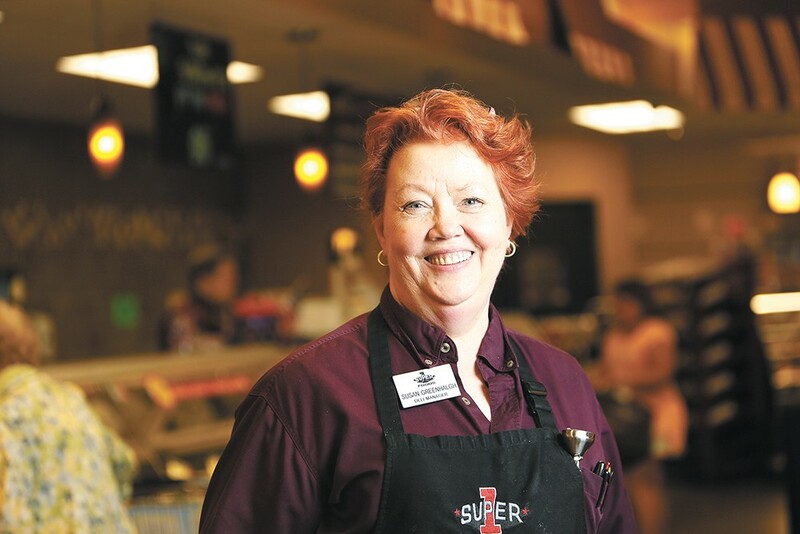 That was the first of many conversations with Susan Greenhalgh, deli manager at Super 1 on Spokane's South Hill. Through her, I discovered Genoa salami (completely different from the hard salami I'd been buying for years). She also weighed in on the best cooking oils for high heat, and from time to time, she'd hand me a package of cheese — an aged Gouda or a smoked Gruyère — and tell me I needed to buy it. It didn't take me long to figure out that when she said those words, I needed to listen. Along the way, Greenhalgh shared bits and pieces of her life story with me. She and her husband moved to Spokane in 2011 from Phoenix, where Greenhalgh had owned and operated a successful restaurant, the Calico Cow Cafe, for 17 years. Her restaurant and catering business grew from a two-person operation in a storefront with nine seats to a million-dollar historic building and 34 employees. All along, she served classic comfort food: pot roast, chicken and dumplings, and meatloaf. Before that, she worked for a local grocer in the deli department for 13 years, eventually starting a catering company on the side, which helped launch her into the restaurant world. Greenhalgh and her twin sister were mostly raised by her grandparents and aunts in the Smoky Mountains before going to live with their very young mother, eventually landing in Phoenix. "I was never interested in food," she says. "My mother, God bless her soul, is an awful cook. I remember with Grandma, we ate very simplistic food — no spices, nothing. I really did not know what good food was." Though she wasn't a natural cook at first — "I remember the first gravy I ever made looked like tapioca," she laughs — in her thirties and with three kids at home, Greenhalgh came across a copy of Bon Appétit magazine and her world opened. "I started experimenting a little bit," she says, "And, oh, it was wonderful." For her 50th birthday, she earned an associate's degree in food administration and culinary arts, capping years of self-taught experience with a diploma. Still, the toll of small business ownership — long hours with no guaranteed paycheck — began to wear on Greenhalgh. "I was tired, and I always said that I was married to the restaurant and my husband was my affair," she says. "I just reassessed my life." Although she knew she would miss elements of her work in the restaurant — the customers and employees most of all — it was time for a change. A serendipitous suggestion from family in Idaho brought the Greenhalghs to the Inland Northwest. "I fell in love with Spokane," she says. Greenhalgh loves to share her deep culinary knowledge with customers. Once in Spokane, Greenhalgh had trouble finding work. "I must have applied at 50 places," she says. "I never thought about age discrimination or being overqualified." Though she wanted to work for an independently owned company, she eventually accepted a job in the deli at a national chain. Even then, Phoenix hadn't quite loosened its grip on her; she was still flying back and forth to Arizona to cater for her favorite customers. After two years in Spokane, one of the chain stores closed and Greenhalgh's hours were cut. A union rep suggested she apply at Rosauers. It didn't take long for her to rise through the ranks. In December of 2014, she took over the deli department at Super 1. "The minute I walked in the store, I loved it," she says. "The energy was just so good there." Still, there were things that needed to change. "I don't do mediocrity well, and I'm very in-your-face," says Greenhalgh. "I said: 'We will lead by a standard of excellence from this day forward, and I will invite all of you to play at that level. We're going to make this the best party in town.' I've stuck by that, and I have been 100 percent supported by the whole store." Greenhalgh was intuitive about what would work in her department, and wasn't afraid to speak her mind to management. "I don't have a lot of time for small talk. I have havoc to wreak," she told them. Greenhalgh began making soups and salads from scratch using recipes from her restaurant, as well as a potato salad her grandmother used to make. Now she sells 120 pounds of that potato salad a week. "People are so hungry for things that they can taste the energy in, and that is not loaded with preservatives," she says. At her former restaurant, as well as in the deli, it's Greenhalgh's care for people which sets her apart. "I knew people were starved to know that they mattered, that if they weren't there, they would be missed," she says, reflecting on the restaurant. "That became very important to me, as it is here, to say: 'Where have you been? I haven't seen you for a few days,' and then I'll make a joke. They know that they matter, and not only at the deli; they feel they matter from the whole store. You don't get that everywhere." Though you may not guess it from a conversation with her, Greenhalgh is quickly approaching retirement, and she's doing her best to cultivate a team of dedicated people to leave behind. "I want them to know that I don't want to be missed when I'm gone," she says. "That's why it's so important to me that the curry chicken salad is made exactly the same way every time, so there is no 'I like it better when Susan makes it.' I do not want this to be the Susan show." But for a while, you'll be able to catch Greenhalgh in the deli at Super 1 (830 E. 29th Ave.), possibly stocking the cheese table, as was the case the first time I met her. "Don't slow down, because I'll sell you something," she says.